What Knitting is to Me and Too Many WIPs! And maybe I might cast on a pair of knee-highs for me. This next week I will probably bury myself in my knitting. I’ve been trying really hard to not think about it. Next Tuesday, March 19th, was supposed to be one of the happiest days of my life. It’s the due date for my son/daughter. That’s rough (and that’s an understatement). I’ll have to go through this again in July, having lost another son/daughter in January. But I have my knitting. It’s helped me overcome so much. When I feel myself falling apart, I pick up my needles. I work on something to take my mind off of it, and in the end, I get something beautiful and something I can hold. Knitting has given me so much. That’s why I love to share this craft and teach others. You never know what knitting will give you. I also have turned to losing weight, which I’ve written about a handful of times. I have lost 23 pounds since January 6th. There’s a very long way to go, but I’m well on my way. I’m not stopping until I’ve reached my goal. In fact, this morning, my husband and I are closing out week 6 of Couch to 5K. That means 25 minutes straight jogging, no walking. I have such a great support system. My husband (who is the size of a toothpick!) wakes up before the sun with me to go running, and on Tuesdays and Thursdays, a friend from work and I go to the gym. I’m set up for success, and I love it. So, now that I’ve been depressing, I just want to wish you all a very happy weekend! Any fun plans? So thankfully for these gifts of hobby that can help ease us through times of struggle. I can’t decide if I’m a process or product knitter (and sewer, for that matter). I’m kind of a little of both. Although right now I’m completely stalled with indecision around beginning a new project. I have the perfect yarn… I just don’t know how I was to use it to the best of its abilities! I need to work on finishing projects though, I like the finished project but not the sewing up!! Sorry to hear about your losses – it must be really tough. Love the WIPs – I think I must be a process sewer/crafter as I just love having lots of different things to do depending on my mood. Well done on reaching C25K Wk 6 – it’s not as hard it seems once you get out and do it. It’s a great programme to get you moving – I managed it, albeit running slowly, when I was on my fitness regime. I managed to lose 42 pounds over a couple of years – sadly it’s beginning to go back on now as my weight loss/fitness club closed down and I haven’t found the motivation to go elsewhere since….Keep at it – it’s worth it!! What a fantastic post. You are a gifted writer, as well as a great knitter. You’ve not been depressing, you’ve been really uplifting, telling us about how even at a really dark time, you are able to find a kind of solace in a heartfelt activity that you generously share with other people. I think I must be a process knitter too, otherwise I would have sewn up the bag that I finished knitting two years ago (and all the rest!) but there are worse things that people do to cheer themselves up, and sometimes there’s even a hat or sock at the end of it! Thank you for sharing your heart with us. congratulations on taking charge of your health, and the wonderful support of your husband and friends. I’m DEFINITELY a process knitter, to the point where I almost feel let down when I finish a project I particularly liked. 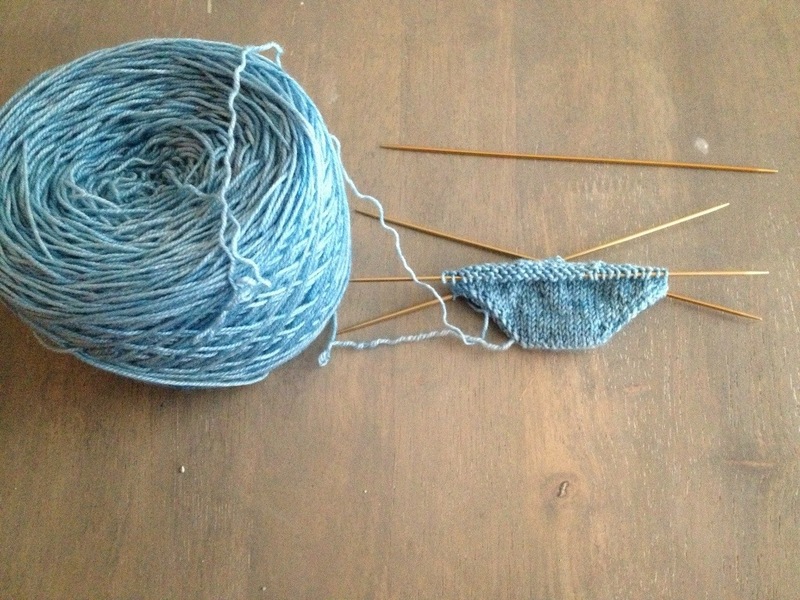 I feel like this is apparent in the way I always get second sock syndrome right at the heel turn of the second sock. I’m definitely a product knitter and sewer. I’m glad knitting has helped you through, its so soothing and meditative, definitely a healing hobby. Well done on the jogging – you star! Knitting and crocheting work therapeutic for me, so I’m definitely a process knitter. I’m sorry for your losses… Good thing you have your crafting and a great husband to lean on. You’re in my thoughts. I’m so sorry for your loss. But it’s true that knitting helps us get through lots of things. I still remember my last months in Belgium which I survived stitch after stitch. I don’t know which kind of knitter I am. I enjoy enormously every second I spend on my knitting, but I also love the finished product. Difficult decision. Thanks for sharing this heartfelt post. I’ve gone through the same losses and know how hard it is to face the “anniversaries.” Glad that you are finding comfort and congrats on the great running progress! I agree with many commenters! There can never be too many WIP’s. They all have a different purpose. I love that your knitting gets you through. I have a wrap that I started knitting when my father was hospitalized, and finished on the day he died. That wrap was such a comfort. It was something I could control in the chaos, and now I wear it all the time. It reminds me of my dad, and how much he loved me, and how much I can get through. Also, great job! Consider signing up for a race. Running road races is so fun, and you’ll be amazing at the diversity of the people who participate, all cheering each other on. You can do it! You are definitely not depressing. Finding solace in your knitting is an inspiration to all of us. I know that sewing is therapeutic for me and I guess that’s why if I haven’t had time to sew I get pretty crabby! Keep up the good work and congrats on your workouts! I plan in to work on purses and free hand embroidery. Your blog is visually appealing. It took me back to my youth and my own two grandmothers. I have blogged a little about your blog. I agree, knitting is therapeutic. I find it relaxing, calming. I used to be a process knitter too, I’d start projects after projects, knit them and procrastinate when it got to sewing all the parts together. These days though, I rarely knit for myself; my knitting is all gifted to others for birthdays or just because so the deadlines really help and I now get as excited about the finished product than I do about the knitting. I think there can never be too many WIPS!!!! This way we never get bored and all of the projects going on influence and help problem-solve the others! Cheers to WIPS! Fun read, thank you! Congrats on the weight loss. I need I start on my goals! I am sorry to hear of your losses. I understand that feeling because I have lost four myself. I love how knitting can help through struggles too, and I’m glad that it is helping you. I hope you are having a great weekend! I know exactly what you mean about the WIPs I’ve decided to try working through one a week to save the pile from growing even more. I’m definitely a process maker and love experimenting so gather loads of little samples that end up sitting in a draw! I’m so sorry to hear about your losses. I hope you can find comfort in your knitting to help you through the difficult days, I really believe in the therapeutic qualities of craft it can be a great focus. I’m so sorry for your loss. I hope you can do something nice for yourself tomorrow. I love that we have knitting and running in common! I’m really glad that knitting has been helping you overcome something so difficult. I totally understand that it’s more about the process than the finished item itself. They say life is like that…that it’s not about the destination, but the journey. Best wishes to you! So sorry to hear of you losses. I know how difficult and emotional those times are. Wishing you peace and comfort. Thank you for sharing! Sorry for your losses. Yes WIPS are important! The more the merrier! I admire your resolve to get through your pain and your positive approach to your get fit campaign, highly commendable. Thank you for sharing your pain, I am sure we will all be thinking of you and hope that you feel our support on your difficult days. You have great husband and friends around you which must be reassuring. I crochet more than knit but think I must be a project person, I tend to just have one major project on the go at once although I invariably have a couple of smaller things started on as well, just for when I need a break. Thanks for stopping by and liking my post, hope you like it if you give the Vegetable Chowder a try. Crafts like knitting and crochet (which is what I do – knitting just makes me sad ;-( ) act as a meditation for us, a way to calm and concentrate and create – the three Cs. Well done for the weight loss – I am doing the same, plus giving up drinking, Iv’e only lost 14 pounds since the start of the year though. Still, keep on keeping on and we will win. It is so true that knitting is therapeutic – I returned to this ancient craft at a very dark time in my life and all my sympathies to you during yours. Thank you for sharing this, it is brave, honest and open and makes such a difference in the current world. I love your blog – a great mix of teaching, sharing and life. I like to think of them as UFOs (unfinished objects) or that I am working on my PHDs (projects half done). I agree with those above – never too many WIP and 7 seems so low.. 🙂 Love your blog! I love those acronyms! Much more fun than NFO. As you so succinctly write: you are not depressing you are processing. Every stitch you make, every step you take….you are helping yourself. Thank you for this entry – for sharing of yourself and your losses. As I read your entry I couldn’t help but cry in empathy and at my own loss. I passed a due date not that long ago. And I can honestly say that knitting is one of the things that helps me get through. My heart goes out to you today. In terms of being a process vs product knitter, I would describe myself as being a product knitter in practice but really a process knitter at heart. I love the experience of inspiration and the desire and drive to create something with yarn. Sometimes, all I can do is think about knitting and the long list of projects I want to start. And I use to do just that – start a lot of different projects. But then I discovered the joy I experience when I finish a project and I decided to set a rule for myself that I had to finish a project before starting the next, or else I don’t seem to finish anything. Generally I follow that rule (though I have about three different ‘granny’ crochet blankets going at the moment…. ), but my mind is always yearning after the other projects I could be working on. Either way, knitting is such a joy! Thanks very much for your heartfelt post. Since the loss of a family member 3.5 years ago, I go through ups and downs and I do find that sewing or some other craft helps me to keep calm and de-stress. There’s nothing wrong with being a process knitter. It’s why I like to use bamboo needles – I love the feel of them. If it was all about getting to the finish line, I’d learn to put up with the feel and sound of aluminum clicking! Thanks for all the likes on my posts, AMW. I was so glad to hear that I am not the only one who has a lot of WIPs. I eventually get them all finished but I love having a variety of things going so that I can choose what I feel like working on at the moment. I’m so sorry about your losses – I wish I could give you a hug!. Keep crafting – I have found it really helps during difficult times. I’m sorry for your losses and thanks for sharing your story… I have several WIPs.. and once in a while, I’ll come across one that I’ve buried away and wonder… “Why did I stop that one?” Usually, I can’t think of why… but I also can’t start up again since I don’t know where I left off (grrrr. )… these days, I try to stick with one and finish it. Unfortunately, its hard to stick to that. I have 2 WIPs right now, officially. One is my GoT blanket panels… and the other is a scarf from sock yarn — but that’s getting frogged today. My heart goes out to you and your husband on your losses. I’m so sorry for both of you. Thank you for sharing. “I am process knitter” is genius! I am so sorry for you loss, there should be an app for virtual hugs. Thank you as always for such a wonderful blog! Well that sums me up in a nutshell! Thanks for the “like”! As much as I’ve loved learning about wool, I haven’t yet learned how to knit. My grandmother also tried to teach me when I was young, but, alas, it didn’t stick. I have a sneaking suspicion you might just inspire me to action one of these days! I wish I could knit! Just a cool hobby.